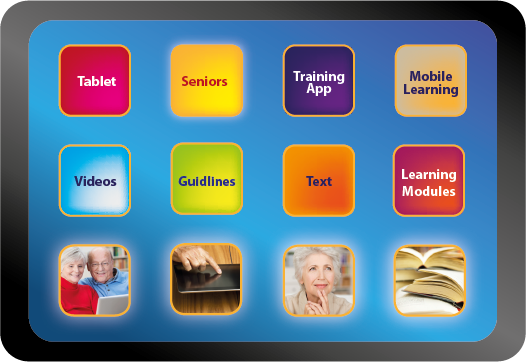 The project SenApp - Seniors Learning with APPs - aims at developing a Training App for seniors in four European countries (France, Spain, Romania and Germany) to support them effectively and individually to become competent ICT (Information and Communication Technologies) users. This project focuses on the need for eInclusion of senior citizens in Europe, the latter still being very much under-represented when it comes to competent and self-directed use of ICT. The digital divide still concerns, to a major extent, the older population. Using a mobile learning training Approach for easy to handle tablet-computers SenAPP will support seniors optimally in the process of accessing and becoming involved in the information and knowledge society, by applying the well-proven formula of using ICT as a learning medium as well as a learning content (eLearning environment). SenApp will utilize the potentials of ICT for the older generation by developing a non-formal, flexible and accessible App-based ICT qualification course that matches the very specific needs of this heterogeneous target group. Special focus will be given to multimedia-enriched didactic elements (demonstrations, audio-visual elements, interactive exercises), in order to cope with the diverse impairments, fears and disabilities of seniors. The modular course concept makes it possible to choose and aggregate a variable number of learning units into one course in the training App environment, to respect prior knowledge, demands and preferences. The effective and flexible App-Training Approach will be designed and developed in a way that makes it possible to localize the training system to every country and language interested in using it. The project expects to highly contribute towards the digital society and the Europe 2020 goals.